Navigating the site by browsing through the stages and tasks is particularly helpful for new researchers or researchers who are new to campus. It can also be helpful if you are unsure of the resource or type of resource that you are looking for. 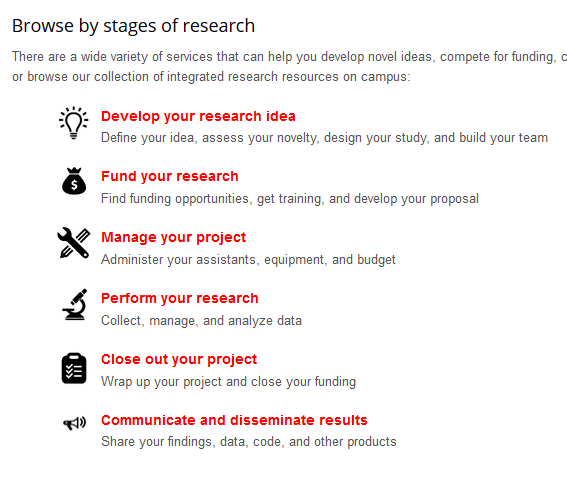 Resources are organized first by research stage (See Image), then by tasks that are performed within each stage (See Image). The tasks include activities that are important to consider while working to fund your research so that you are better prepared to start your research if your proposal is successful. Under each task, you will find applicable resources that you can use to help you carry out that task (See Image). 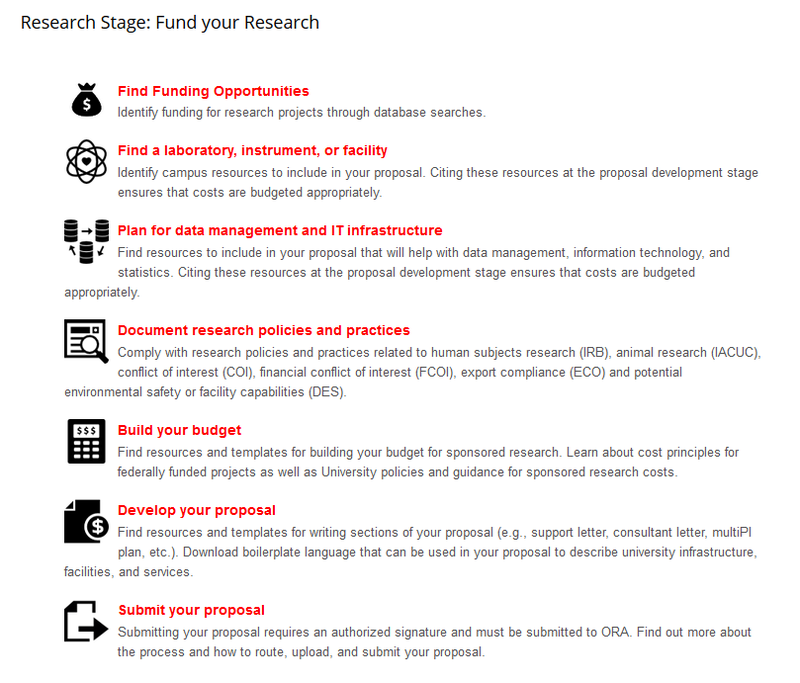 For example, under the research stage Fund your research, you will find the task Plan for data management and IT infrastructure. Planning for data management or IT infrastructure is important in the Fund your research stage because it will help you ensure that you budget appropriately so that your costs and processes accurately represent how you will perform your research. Accurate planning also ensures that you are prepared to start your project as soon as you receive the award. To begin browsing, go to the home page, and click on one of the research stages. Then find and click on the task you need to complete. You will then be presented with a list of resources for that task. If you would like to switch to a different task within that stage, use the menu on the left and click on a different task. You can also use the menu on the left to go to the resources from a different stage. If you would like to return to the list of research stages with descriptions, click on the Home link on the menu. Navigating the site by searching and using the filter terms is useful for researchers who have a specific need and would like a list of resources to help them fulfill it. For example, if you are looking for information on protecting intellectual property, go to the search box on the home page, type “intellectual property,” and click Search. You will then be given a list of resources related to intellectual property. You can filter the resources on the left by clicking on the stage of your research, the task you are trying to accomplish, or the category of resource. Proposal templates: Click on this link in the top menu to find templates and boilerplate text to use in developing your research proposal. Feedback: Can’t find what you’re looking for on our site? We are constantly adding resources and welcome your ideas and input as to other resources to include. If you see something that needs to be changed, we would like to know that as well. On this page, you’ll find a form to submit your feedback. About: Learn more about the partnership that created IRRoC.